- You are booked on sharing basis hence all the co participants must cooperate with each other. Priority must be given for senior citizens for the front seats. Parents with children who are less than 12 years are only allowed to sit in rear seat as per the UAE Law. Driver will be the master of the roaster in allocating the seats. Alternatively the co-passengers must sort out among themselves by shifting equal time on the preferred seats. No prior request for the seats will be entertained since everyone pay the same. Anyone who does not agree to the seating allocation may request for an exclusive jeep by paying the supplementary charges directly. - Guest can opt to do the program in 2 days or the same day. - Dubai city tour on Friday mornings will be limited to 04 hours as the museum is closed and there is not traffic on the roads. - Soft beverages, tea/coffee water is included in the desert safari package will be served at the campsite. - For the desert safari, there will be a restriction on live entertainment Belly dance , Fire show, Tanura dance and serving alcohol throughout the UAE during the below Islamic holidays. Therefore the Safari will be operated without these entertainments and serving of alcohol at the camp site during these days. The same is applicable during Ramadan fasting month (expected to be from 05th May - 05th June 2019 slight change in date based on moon sighting expected, Ascension day Arafat (Haj) Day Al Hijri Islamic New Year Milad Un Nabi the Birthday of Prophet Mohammad. The dates are based on lunar calendar and cannot be pre-advised. Get picked up at your hotel in Dubai city at 9:00am to start your city tour, lasting roughly 5 hours. Ride in comfort through the city in an air-conditioned luxury coach with your guide. Highlights of the city tour include Dubai Creek, Al Fahidi Street, Bastakiya, Dubai Museum (including an entry ticket), Gold Souk, Spice Souk, Souk Madinat, Zabeel Palace (photo stop), a boat ride across the creek, Palm Island, Atlantis (photo stop), Dubai Marina, Jumeirah Beach and Mosque, Burj al Arab (photo stop), Ski Dubai (drive through), Sheikh Zayed Road, Emirates Towers, and Burj Khalifa (photo stop). The city tour concludes at about 2pm at a food court where you can have your lunch at your own expense. You will be picked up from the food court and continue to the desert for the second part of the excursion, the 7-hour desert safari, continued after lunch. The safari program will be done in a luxury 4x4 Jeep equipped with anti-roll bar protection cages for extra safety driven by a specially trained safari guide. Enjoy a fun-filled evening in the desert, complete with a drive through a camel farm and oasis, a welcome Arabic coffee with dates at the camp, refreshments and snacks at the camp during sunset, a special photo session with Arabic costumes for you to wear, a belly dancing show, a tanoura show, shesha, a camel ride at the camp, sand boarding, and henna designers on hand to decorate your skin. Dine on a delicious BBQ buffet dinner with unlimited soft drinks as well. 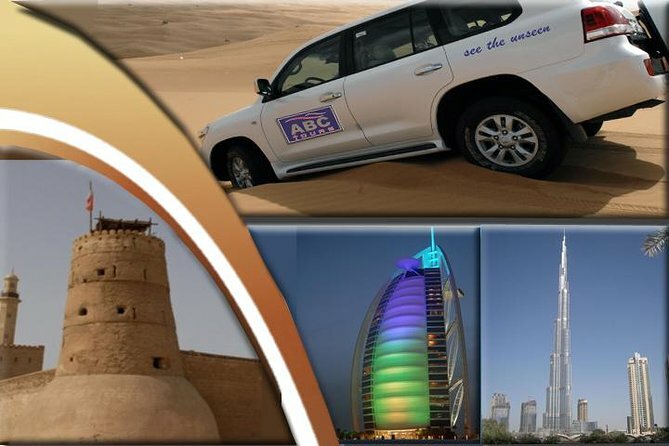 After the desert safari program you will be dropped back to your hotel in Dubai. The city tour was good; bur very rushed. We should have been given at least 15 minutes to shop at the gold market. The desert experience was excellent and the show at the camp was great. The food was good to. The drive thru the desert was exciting! Absolutely great value for money. Our city tour guide Rafiq was very knowledgeable with a good sense of humor. Very accommodating with any reasonable request. The Safari went on a bit too long but it was still enjoyable. All the staff involved in this tour from morning til night time were helpful and polite. Highly recommended. Great City Tour! Desert Safari was a blast! What a fantastic tour! Our driver, Asif, was excellent. He is highly skilled in the art of dune bashing--driving with safety and precision while also giving us the thrilling ride of a lifetime! We also appreciated his informative commentary on the interesting sites we passed on the way to the desert safari. The meal afterwards was delicious--so many tasty dishes to indulge in! 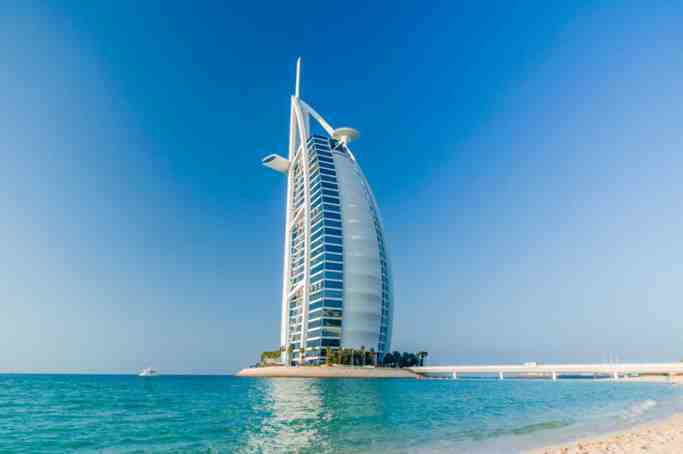 We would highly recommend this tour to anyone wanting to experience Dubai! this tour suitable for me who dont have alot time in dubai. i was in transit and this tour cover all Dubai spot for me to have a look and short time to check them all. u shall not miss it if u wanna check in all dubai spot and photos. feels like u have been all in Dubai experiences. I was on a stopover in dubai, within my limited time I got a chance to do the best 2 tours in Dubai. Thank you ABC !!! Well organised tours ! Good guide, lot of interesting places to visit. Both Tour was awesome and very meaningful. I personally thinks that it’s Worth the money for both tour. Awesome Tourguide and the dune bashing and other activities were awesome. Manage to ride on and took picture of the camel. The buffet especially the lamb Bbq is awesome. This was an all day tour with ABC Tours. We had a driver and tour guide in the morning. They were right on time and very polite. They gave us a great tour with plenty of photo opportunities. In the afternoon we were picked by a different driver in a 4x4 who took us out to the desert safari. Again he could not do enough to help. Great fun and really looked after us and took photos also looked after us at the barbecue. The office also kept in touch and you felt that they cared about satisfaction. They gave us a great day to remember. Many thanks and no hesitation in recommending. City tour was great, Rafick spelling? was an excellent guide. The tour covered I am assuming all the main attractions that HOHO would, but the advantage was that our bus would actually wait for you. The afternoon Desert Safari was all that we reasonably expected. Great Dune Bashing, and this comes from Scared to death old Grandmother. Again, the 4x4 driver - Sadick was professional, considerate and knowledgeable. The Camp food and show that followed matched what was described : 2 min camel stroll, 3 performers very good fire dance and traditional Derwish dancer, OK food mostly veggies - not fabulous but good, as my good old friend was always saying. Overall, its a great deal. The sand dunes adventure is really boring . It’s not as expected. The driver is so unprofessional and the attitude is very rude and harsh. It’s very impolite. The food is average. And there is no sand boarding and hyena tatto as it’s promise. The tour is not recommended at all.